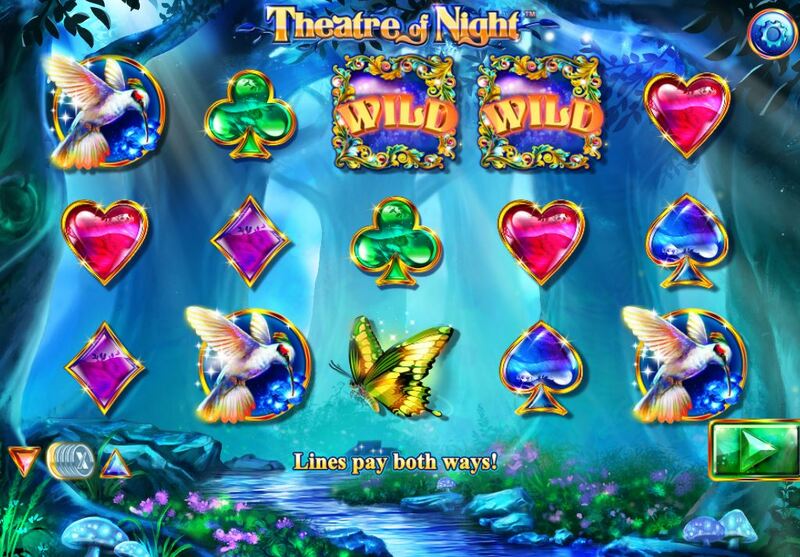 Theatre of Night slot is another brightly coloured Nextgen game, and has a theme that seems to be very popular of late in that the background is a mystic forest similar to Thunderkick's Well Of Wonders and iSoftBet's Forest Mania games. 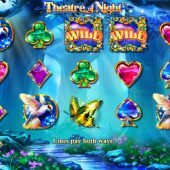 Like those two, Theatre of Night has fruits and creatures of the forest in abundance and rather frantic tinkling music overlaying it. So, what performances does this theatre have in store for us? There are 10 pay lines which play both left to right and right to left and for which 25 credits must be bet. The card symbols are nice gemstones with gold surrounds and the Firefly Wilds pay best at 30x stake for 5-of-a-kind although, as we will see, you can't get 5 in the base game. The Humming Bird pays 16x stake and the lowest card icon 1.4 x stake. I did notice though that 5-of-a-kind wins effectively pay double because the winning line gets paid both ways! There are no scatters in this pretty basic game model, but we do have a respin session when you land all 3 possible Firefly Wilds on reels 2, 3 and 4. This will trigger 6 respins which cannot be added to or retriggered. During these then centre reel becomes Wild and Firefly Wilds on reels 2 and 4 much more frequent. Their enhancement is random expansion - they can expand to fill the reel or replicate themselves over any symbol(s) on the reels next to them i.e. on reel 1 if one lands on reel 2 or reel 5 if one lands on reel 4 or both at once. Now it is possible to get 5 Wilds! This makes the highest win for a full screen 300x stake presumably doubled for both ways paid to 600x stake.